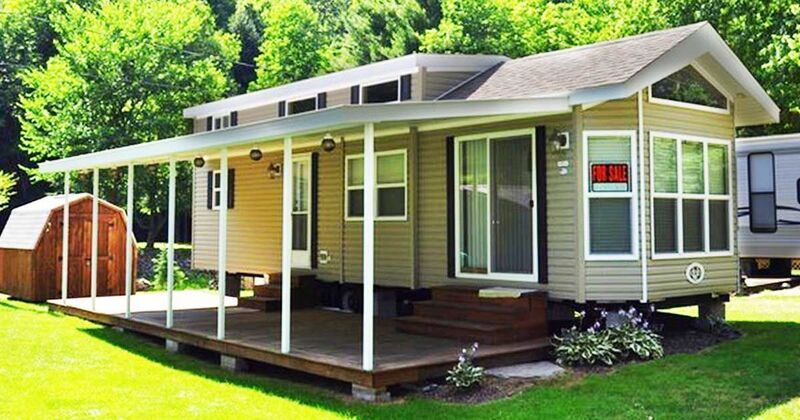 We're back in the green hills of Pennsylvania with a park model cottage from Wellsboro. 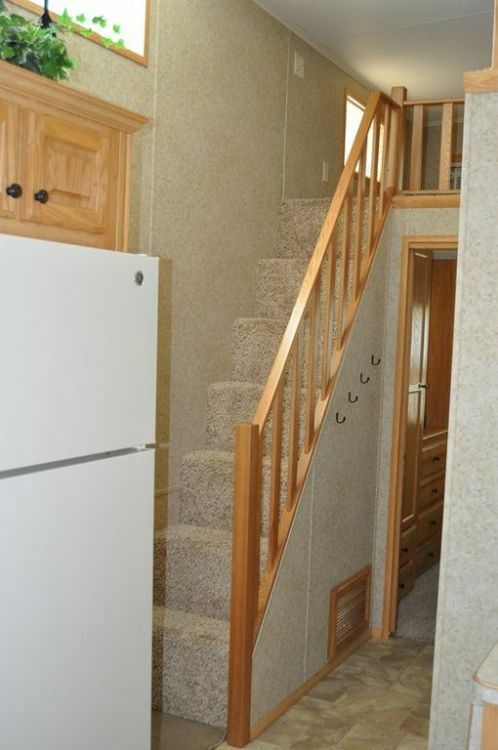 Not only is this park model very recent, but it has a sweet surprise waiting just outside the back door. The park model is in prime condition, as it should be – it's practically brand-new! Every feature, both inside and outside, is sparkling fresh. 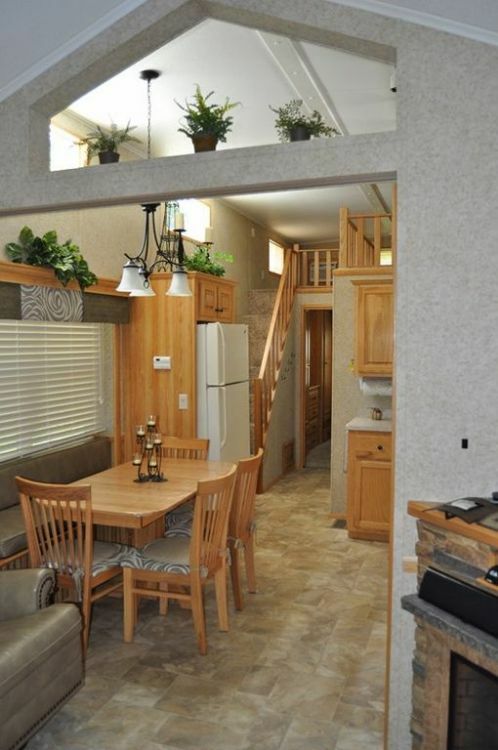 It would make the perfect vacation getaway or in-law suite, but you may just be tempted to move in full-time! The covered deck has been pressure treated for added protection against insects and decay, so you know it's going to last for a long time. 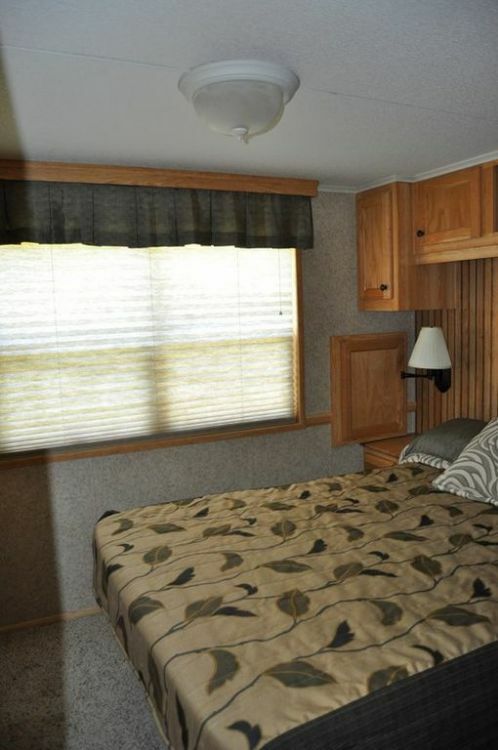 The deck also has lighting inside the awning so you can spend evenings there in comfort. 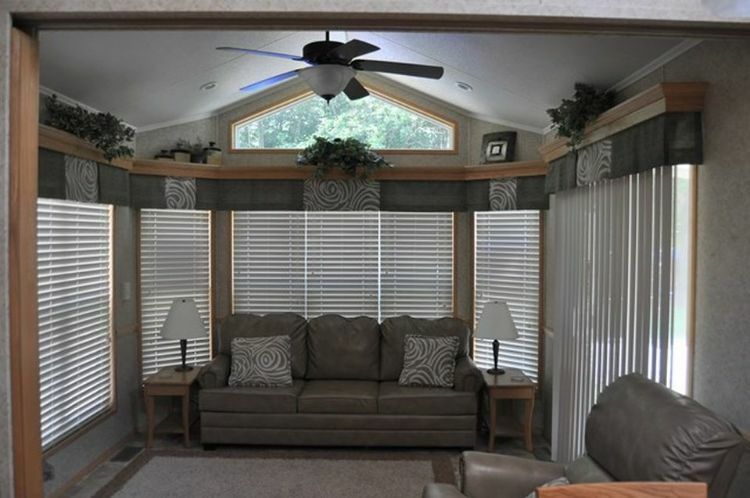 Leather is a luxury few can afford, but this park model's living room comes furnished with gray leather furniture and matching throw pillows. Even the curtains match with it. 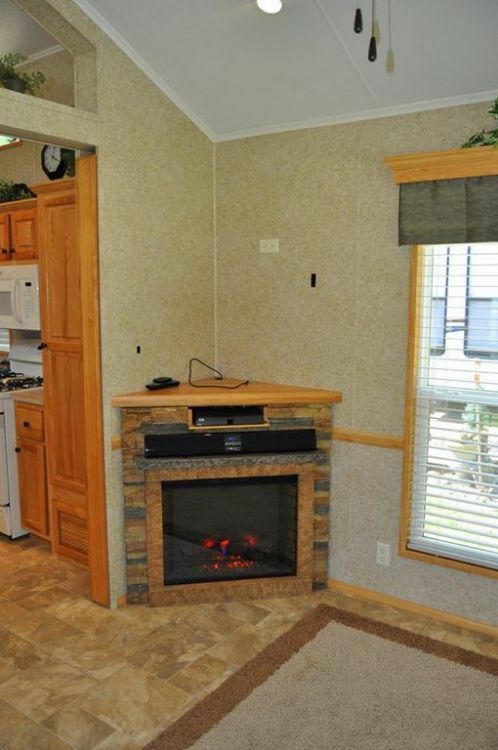 A combination TV stand and electric fireplace will keep you warmed up in the winter as you watch your favorite flicks. The sweet but simple dining area has a banquette with plush seating. What really caught our eye was the gorgeous, tasteful chandelier. There's even a matching centerpiece with tealight candles – cute! 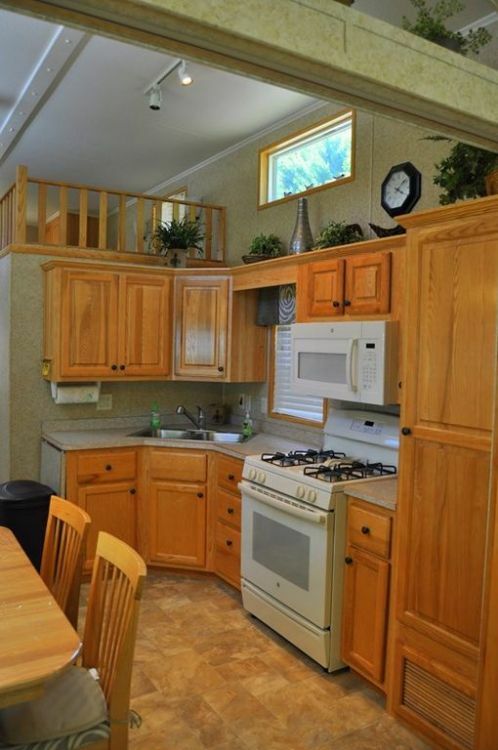 This park model's owners made no sacrifice in size; all kitchen appliances are full size. The bedroom décor is in keeping with the gray striped aesthetic of the living room. You'll find loads of closet space here. 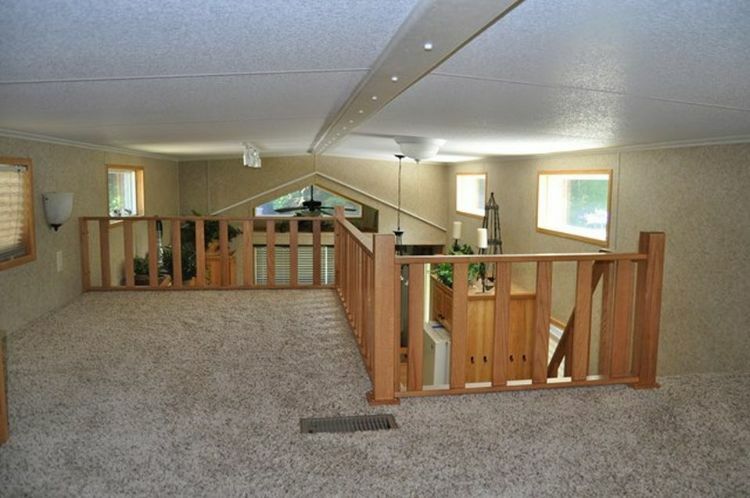 Extra sleeping space can be found in this park model's loft. A handy set of coat hooks on the side of the stairs frees up room in your closet for more clothing. Last, but not least... the view. Who couldn't fall in love with a gorgeous setting like this? 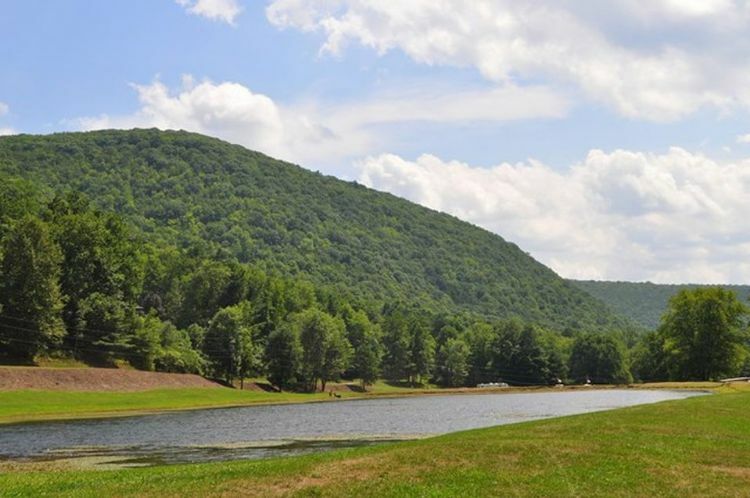 You could spend your vacation in the lap of luxury amidst the beautiful, lush green hills of Pennsylvania. What are you waiting for? Share this lovely park model with your family and friends on Facebook and Twitter. Don't forget to like our Park Model World Facebook page to see more great properties.